After reading Mother Jadurani's article "No Kalki Avatar In This Kali Yuga" I would like to make a few comments. In her article she says she says "Srila Maharaja mentioned a few times that in this age of Kali, Kalki avatar doesn't come" she further says. "So Kalki comes, not to preach, but to kill all the sinners and usher in the next Satya Yuga. In a humble way I told this to Srila Maharaj and he answered, "Not in this Kali Yuga. He won't come. But if he comes, no harm; he will be raising his arms and chanting 'Hari Bol! Hari Bol!' in Mahaprabhu's sankirtan movement." In his book Laghu-bhagavatamrta, Srila Rupa Gosvami has enumerated the following twenty-five lila-avataras: Catuh-sana, Narada, Varaha, Matsya, Yajna, Nara-Narayana, Kapila, Dattatreya, Hayasirsa (Hayagriva), Hamsa, Prsnigarbha, Rsabha, Prthu, Nrsimha, Kurma, Dhanvantari, Mohini, Vamana, Parasurama, Raghavendra, Vyasa, Balarama, Krsna, Buddha and Kalki. Sri Caitanya Mahaprabhu is not mentioned as a lila-avatara because He is an incarnation in disguise (channa-avatara). In this Age of Kali there are no lila-avataras, but there is an incarnation of the Lord manifested in the body of Sri Caitanya Mahaprabhu. This has been explained in Srimad-Bhagavatam. Mother Jadurani mentions the above quote from Srila Prabhupada to support her claim that the Lord in His form of Kalki doesn't appear in this Kali yuga. atha--thereafter; asau--the same Lord; yuga-sandhyayam--at the conjunction of the yugas; dasyu--plunderers; prayesu--almost all; rajasu--the governing personalities; janita--will take His birth; visnu--named Visnu; yasasah--surnamed Yasa; namna--in the name of; kalkih--the incarnation of the Lord; jagat-patih--the Lord of the creation. TRANSLATION Thereafter, at the conjunction of two yugas, the Lord of the creation will take His birth as the Kalki incarnation and become the son of Visnu Yasa. At this time the rulers of the earth will have degenerated into plunderers. The Kalki avatara will appear at the conjunction of the yugas (yuga-sandhyayam) which cannot be said as Kali yuga or Satya yuga. Los Angeles, February 18, 1970) Lord Buddha who is also mentioned by Srila Rupa Goswami as a lila-avatara, along with Lord Kalki, also appeared. Therefore there is no contradictions in Srila Prabhupada's statements. In this age of Kali there are no lila-avataras, but Lord Kalki is coming thats for sure, and he will perform mass throat cutting with raised sword. 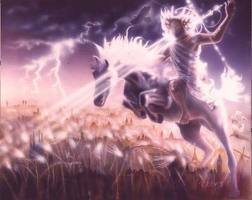 Hamsaduta: Actually in the Bible there's, someone mentions there the description that the Lord will come and He will ride on a white steed, on a white horse. And at that time he will kill all the non-devotee people. It's also in the Bible. SB1.3.24 Srimad-Bhagavatam was composed just prior to the beginning of the age of Kali (about five thousand years ago), and Lord Buddha appeared about twenty-six hundred years ago. Therefore in the Srimad-Bhagavatam Lord Buddha is foretold. Such is the authority of this clear scripture. There are many such prophecies, and they are being fulfilled one after another. They will indicate the positive standing of Srimad-Bhagavatam, which is without trace of mistake, illusion, cheating and imperfection, which are the four flaws of all conditioned souls. The liberated souls are above these flaws; therefore they can see and foretell things which are to take place on distant future dates. Thereafter, at the conjunction of two yugas, the Lord of the creation will take His birth as the Kalki incarnation and become the son of Visnu Yasha. At this time the rulers of the earth will have degenerated into plunderers. Here is another foretelling of the advent of Lord Kalki, the incarnation of Godhead. He is to appear at the conjunction of the two yugas, namely at the end of Kali-yuga and the beginning of Satya-yuga. The cycle of the four yugas, namely Satya, Treta, Dvapara and Kali, rotates like the calendar months. The present Kali-yuga lasts 432,000 years, out of which we have passed only 5,000 years after the Battle of Kurukshetra and the end of the regime of King Pariksit. So there are 427,000 years balance yet to be finished. Therefore at the end of this period, the incarnation of Kalki will take place, as foretold in the Srimad-Bhagavatam. The name of His father, Visnu Yasha, a learned brahmana, and the village Sambhala are also mentioned. As above mentioned, all these foretellings will prove to be factual in chronological order. That is the authority of Srimad-Bhagavatam. The age of Kali-yuga is said to start from the year 3102 BC, after the disappearance of Lord Krishna. Lord Caitanya appeared 500 years ago, at which time the Golden Age within Kali-yuga is supposed to start and last another 10,000 years. As the Golden Age within of Kali-yuga comes to a close, the lower modes of material nature will become so strong that people will lose interest in spiritual topics. It is said that everyone will become godless. Whatever devotees, bhaktas, and sages are left on the planet will be so unique in character and peculiar compared with the rest of society that they will be ridiculed and hunted down in the cities for sport like animals. Thus, they will flee the cities to live underground in caves or high up in the mountains, or simply disengage from the earthly plane of existence. In this way, they will disappear from the face of the earth. That is the time when the dark influence of the age of Kali-yuga will become so dominant that its full influence will manifest without hindrance. Finally, after 432,000 years from the beginning of the age of Kali, Lord Kalki will appear as the twenty-second incarnation of God. This is very similar to what some people call the second coming of Christ. The Vishnu Purana (Book Four, Chapter 24) also explains that, "When the practices taught in the Vedas and institutes of law have nearly ceased, and the close of the Kali age shall be nigh, a portion of that divine being who exists of His own spiritual nature, and who is the beginning and end, and who comprehends all things, shall descend upon earth. He will be born in the family of Vishnuyasha, an eminent brahmana of Shambhala village, as Kalki, endowed with eight superhuman faculties." The Agni Purana (16.7-9) also explains that when the non-Aryans who pose as kings begin devouring men who appear righteous and feed on human beings, Kalki, as the son of Vishnuyasha, and Yajnavalkya as His priest and teacher, will destroy these non-Aryans with His weapons. He will establish moral law in the form of the fourfold varnas, or the suitable organization of society in four classes. After that people will return to the path of righteousness. The Padma Purana (6.71.279-282) relates that Lord Kalki will end the age of Kali and will kill all the wicked mlecchas and, thus, destroy the bad condition of the world. He will gather all of the distinguished brahmanas and will propound the highest truth. He will know all the ways of life that have perished and will remove the prolonged hunger of the genuine brahmanas and the pious. He will be the only ruler of the world that cannot be controlled, and will be the banner of victory and adorable to the world. Here in these verses we find that Lord Kalki will come as a chastiser or warrior. By this time the planet will be filled with people who will be unable to understand logical conversations. They will be too slow-minded and dull-witted, not capable of being taught much, especially in the way of high philosophy regarding the purpose of life. They will not know what they need to do or how to live. And they certainly will be unable to change their ways. Therefore, Lord Kalki does not come to teach, but simply to chastise, punish, and cleanse the planet. Furthermore, we also find the name of the place where Lord Kalki will appear and the name of the family in which He will be born. The family will be qualified brahmanas. This means that a disciplic and family line of spiritually qualified brahmanas will remain on the planet throughout the age of Kali, no matter how bad things get. Though they may be hidden, living in a small village somewhere, it will be this line of bhaktas, spiritual devotees, from which Lord Kalki will appear in the distant future. No one knows where this village of Shambala is located. Some feel that it is yet to manifest, or that it will be a hidden underground community from which Lord Kalki will appear. In this connection we find in the Padma Purana (6.242.8-12) the prediction that Lord Kalki will be born in the town of Shambala near the end of Kali-yuga from a brahmana who is actually an incarnation of Svayambhuva Manu. It is described that Svayambhuva performed austerities at Naimisa on the bank of the Gomati River for acquiring the privilege of having Lord Vishnu as his son in three lifetimes. Lord Vishnu, being pleased with Svayambhuva, granted the blessing that He would appear as Svayambhuva's son as Lord Rama, Krishna, and Kalki. Thus, Svayambhuva would appear as Dasaratha, Vasudeva, and then Vishnuyasha. Also, in the Padma Purana (1.40.46) we find Lord Vishnu admits that He will be born in Kali-yuga. Thus, He will appear as Lord Kalki. The Srimad-Bhagavatam (12.2.19-20) describes Lord Kalki's activities as follows: "Lord Kalki, the Lord of the universe, will mount His swift white horse Devadatta and, sword in hand, travel over the earth exhibiting His eight mystic opulences and eight special qualities of Godhead. Displaying His unequaled effulgence and riding with great speed, He will kill by the millions those thieves who have dared dress as kings." We should make note here that, as the Vedic literature explains, when the Supreme kills anyone, that person is immediately spiritually purified by His touch and because the person is focused on the Supreme Being while leaving his body. Thus, that person attains the same destination as those yogis who spend years steadying the mind in order to meditate and leave their bodies while focused on the Supreme. So being killed by the Supreme is a great advantage for those of a demoniac mentality who would otherwise enter lower realms of existence or even the hellish planets in their next lives. The Vishnu Purana (Book Four, Chapter 24) continues to explain Lord Kalki's activities: "By His irresistible might he will destroy all the mlecchas and thieves, and all whose minds are devoted to iniquity. He will reestablish righteousness upon earth, and the minds of those who live at the end of the Kali age shall be awakened, and shall be as clear as crystal. The men who are thus changed by virtue of that peculiar time shall be as the seeds of human beings, and shall give birth to a race who will follow the laws of the Krita age [Satya-yuga], the age of purity. As it is said, 'When the sun and moon, and the lunar asterism Tishya, and the planet Jupiter, are in one mansion, the Krita age shall return.'" The Agni Purana (16.10) also relates that Hari, after giving up the form of Kalki, will go to heaven. Then the Krita or Satya-yuga will return as before. Additional information that can help us understand the activities of the next coming of God is found in the Linga Purana (40.50-92), the Brahmanda Purana (1.2.31.76-106 & 2.3.73.104-126), and the Vayu Purana (58.75-110). In these texts we find descriptions of Lord Kalki as He will appear in the future and also as how He appeared in previous incarnations as Pramiti in this time period known as the Svayambhuva Manvantara. These texts tell us that as Kali-yuga comes to a close, and after the death of Bhrigu (or in order to slay the Bhrigus), Kalki (Pramiti) took birth in the Lunar dynasty of Manu. He will wander over the planet without being seen by any living being. Then he will start His campaign in His thirty-second year and roam the earth for twenty years. He will take with Him a big army of horses, chariots, and elephants, surrounded by hundreds and thousands of spiritually purified brahmanas armed with weapons. [Being brahmanas, these weapons may be brahminical weapons that are activated by mantras, such as the powerful brahmastra rather than base weapons of combat such as knives, swords, and spears, or even guns and ordinary explosives.] Though they may try to do battle with Him, He will kill all of the heretics [and false prophets] and wicked, mleccha kings. In a previous incarnation He killed the Udicyas (Northerners), Madhya Deshyas (residents of the middle lands), Purvatiyas (mountain dwellers), Pracyas (Easterners), Praticyas (Westerners), Dakshinatyas (of Southern India), the Simhalas (Sri Lankans), Pahlavas (the fair-skinned nomadic tribes of the Caucasus mountains), Yadavas, Tusharas (people of the area of Mandhata, India, or present day Tukharistan), Cinas (Chinese), Shulikas, Khashas, and different tribes of the Kiratas (aboriginal tribes living in north-eastern India and Nepal) and Vrishalas. No one could stop Him as He wielded His discus and killed all the barbarians. When He was finished He rested in the middle land between the Ganges and Yamuna with His ministers and followers. He allowed only a few people to remain, scattered over the planet. These would be as seeds for the next generations that would follow in the next Satya-yuga. Thereafter, when Lord Kalki has made way for the next age of Satya-yuga, and delivered the earth and whatever is left of civilization from the effects of Kali-yuga, He will go back to His eternal abode along with His army. Continuing with the description of Lord Kalki as described in the Linga, Brahmanda, and Vayu Puranas, they explain that after Lord Kalki returns to His eternal abode, when those subjects surviving at the end of Kali-yuga are enlightened, the yuga changes overnight. Then the minds of all people will become enlightened, and with inevitable force Krita or Satya-yuga sets in. People will then realize the soul, and acquire piety, devotion, tranquility, and clear consciousness. Then those Siddhas [the enlightened and perfected living beings who had remained invisible on a higher dimension through the end of the age of Kali] return to the earthly dimension and again are clearly visible. They establish themselves with the return of the Saptarishis, the seven sages, who instruct everyone about spiritual life, Vedic knowledge, and the progressive organization of society for a peaceful and fulfilling existence. Then again people flourish and perform the sacred rites, and the sages will remain in authority to continue the advancement of the new Satya-yuga. Herein we can understand that Lord Kalki will simply chastise by killing all of the evil kings and rogues and thereby bring in a new era of enlightened beings, a race whose minds will be as clear as crystal. They will produce offspring that will follow the tendencies of real human beings as found in the age of Satya-yuga. Srimad-Bhagavatam (12.2.21-24) further describes that after all of the devious and fake kings have been killed, the remaining residents of the towns and cities will smell the breezes that carry the sacred aroma of the Lord's sandalwood paste and decorations, and their minds will then become spiritually purified. When the Supreme Being appears in their hearts in His form of pure goodness, the remaining citizens will abundantly repopulate the earth. With this appearance of Lord Kalki, Satya-yuga will begin again and the remaining humans will produce children in goodness. Thus, when the moon, the sun, and Jupiter are in the constellation Kartaka, Cancer, and together enter the lunar mansion of Pusya, that is when the age of Satya-yuga will begin. Therefore, as related in the Bhagavatam (12.2.34), after one thousand celestial years of Kali-yuga, Satya-yuga will again manifest. At that time the minds of men will be self-effulgent. The Vishnu Purana (Book Four, Chapter One) also relates that the Vedas and the principles of sanatana-dharma, or the eternal nature of the soul, fade and disappear from the planet at the end of every four ages. 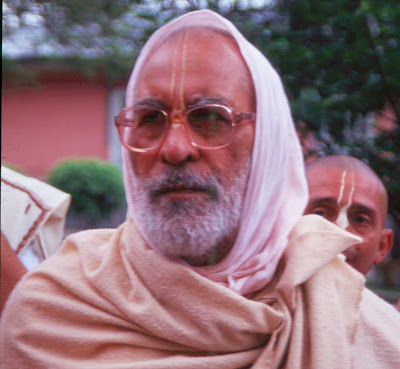 The Bhagavatam (8.14.4-5) also confirms that there are saintly persons who help reestablish these principles in Satya-yuga along with the basis of varnashrama, which is the proper organization of society for humanity. The Vishnu Purana continues to explain that it is in the jurisdiction of the seven universal sages or rishis (the Saptarishis) to make sure the Vedic knowledge is given currency again, even if these rishis must descend from the higher planets to do so. So in every Satya-yuga the Manu [the demigod son of Brahma who is the lawgiver of humanity] of that age is the author of the body of law, while the sons of Manu and their descendants are sovereigns of the earth. This means that although the genuine spiritual knowledge or Vedic information may disappear from this planet, it is still dwelling elsewhere in the universe, and it is the duty of higher authorities to reestablish it on Earth. To help in this regard, it is predicted in the Srimad-Bhagavatam (12.2.37-38) and the Vishnu Purana (Book Four, Chapter 24) that there are two persons who are waiting for the end of Kali-yuga: Devapi of the race of Puru and brother of King Shantanu, and Maru, a descendant of King Ikshvaku. They will be great kings and will help in the process of reestablishing the proper principles in society. These two are alive even now by their great mystic strength obtained through the power of devotion. They have lived through all four of the yugas and reside in the village of Kalapa. They are waiting for the end of Kali-yuga. Then, at the beginning of Satya-yuga, under the instructions of the Supreme, they will return to society and be members of the family of the Manu and reestablish the eternal religion of humanity, sanatana-dharma, and the institution of varnashrama, which is the proper organization of society for its continued harmony in life, and its material and spiritual progress. They will become great kings and form proper government. Thus, by the arrangement of the Supreme Being, there are those who will always be the guardians of that spiritual knowledge that contains the genuine principles for attaining the real goal of human existence. After all of this is accomplished, as related in the Bhagavatam (12.2.39), the cycle of the four ages of Satya, Treta, Dvapara, and Kali-yugas [a Caturyuga] will continue to repeat itself along with the same general pattern of events. 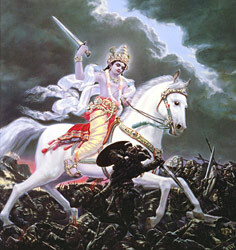 IS LORD KALKI PREDICTED IN THE BOOK OF REVELATIONS? "And I saw heaven opened, and behold a white horse; and he that sat upon him was called Faithful and True, and in righteousness he doth judge and make war. His eyes were as a flame of fire, and on his head were many crowns; and he had a name written, but no man knew but he himself. And he was clothed with a vesture dipped in blood: and his name is called The Word of God. And the armies which were in heaven followed him upon white horses, clothed in fine linen, white and clean. And out of his mouth goeth a sharp sword, that with it he should smite the nations: and he shall rule them with a rod of iron: and he treadeth the winepress of the fierceness and wrath of Almighty God. And he hath on his vesture and on his thigh a name written, KING OF KINGS, AND LORD OF LORDS. And I saw the beast, and the kings of the earth, and their armies, gathered together to make war against him that sat on the horse, and against his army. And the beast was taken, and with him the false prophet that wrought miracles before him, with which he deceived them that had received the mark of the beast, and them that worshipped his image. These both were cast alive into a lake of fire burning with brimstone. And the remnant were slain with the sword of him that sat on the horse." "And I looked, and, lo, a Lamb [a typical symbol for the Divine or an incarnation of the Divine] stood on the mount Sion, and with him an hundred forty and four thousand, having his Father's name written in their foreheads. And I heard a voice from heaven, as the voice of many waters, and as the voice of a great thunder: and I heard the voice of harpers harping with their harps; And they sung as it were a new song before the throne, and before the four beasts, and the elders: and no man could learn that song but the hundred and forty and four thousand, which were redeemed from the earth." One significant description in the above verses is that those who are redeemed from the earth will have God's name written on their foreheads. This is a widespread custom of the brahmanas in India to write the name of God, such as Vishnu or Krishna, on their foreheads. This is tilok, which is usually put on with clay made from the banks of a holy river. We often see this in the middle of the forehead in the shape of a "V" which represents the name of God and that the body is a temple of God, or the three-lined markings of the Shaivites. The Vaishnava mark is made while reciting "Om keshavaya namaha," which means "Salutations to Lord Keshava," another name of Krishna. So herein could be an indication that when the last of society is delivered from the earth during the end times, they will be those who wear the name of God on their foreheads, at least according to these verses. Also, as in accord with other Vedic prophecies, we can understand that there will be very few people left in the world who will have any piety at all. So it would fit in with the Vedic prophecies that by the time Lord Kalki appears, there may, indeed, be only 144,000 who will be left in the world worthy of being delivered from the godless and chaotic conditions of the earth. Or these may be the seeds of the new civilization that will start the beginning of the next age of Satya-yuga. The Appearance of Lord Kalki, the Avatar or incarnation of Godhead, is foretold in the Srimad Bhagavatam 12th Canto and described also in detail in the Brahmanda-purana. Therein it gives predictions as to where he will appear (the village name), who his parents will be, what his mission will be, and when he will appear. It is described that he will appear at the conjunction of the two yugas, namely at the end of Kali-yuga and the beginning of Satya-yuga. The great cycle of the four yugas, namely Satya, Treta, Dvapara and Kali, rotates like the calendar months. The present age of Kali-yuga lasts 432,000 years, out of which we have passed only 5,000 years after the Battle of Kuruksetra and the end of the regime of King Pariksit. So there are 427,000 years balance yet to be finished, till the advent of Lord Kalki. Therefore at the end of this period, the incarnation of Kalki will take place, as foretold in the Srimad-Bhagavatam. The name of His father, Visnu Yasa, a learned brahmana, and the village Sambhala are also mentioned. "Lord Kalki will appear in the home of the most eminent brahmana of Shambhala village, the great soul Vishnuyasha." "Lord Kalki, the Lord of the universe, will mount His swift horse Devadatta and, sword in hand, travel over the earth exhibiting His eight mystic opulence's and eight special qualities of Godhead. "Displaying His unequalled effulgence and riding with great speed, He will kill by the millions those thieves who have dared dress as kings." "After all the imposter kings have been killed, the residents of the cities and towns will feel the breezes carrying the most sacred fragrance of the sandalwood paste and other decorations of Lord Kalki, and their minds will thereby become transcendentally pure." "When the Supreme Lord Hari [Krishna] has appeared on earth as Kalki, the maintainer of religion, Satya-yuga [the age of truth] will begin, and human society will bring forth progeny in the mode of goodness." The mission of Kalki Avatara is to re-establish the religious principles, which have disappeared by the end of Kali Yuga, the iron age of hypocrisy and quarrel. By the End of Kali Yuga, the population of the whole world will be so much reduced to animalism that there will be no more power to understand what is God, or what is spiritualism. And it is already there, the Kali-yuga. It will increase. People will have no power to understand this philosophy, God consciousness. So at that time, when there are no more religious principles, there is no other alternative than to kill them all. At that time the Kalki avatara will come, and He'll take a sword on the horseback, just like a king, He'll simply go on killing all these non-believers, Godless creatures and usher in another Satya-yuga, the golden age of righteousness and truth. Kalki avatara is the last of the ten major incarnations of Lord Vishnu who will appear in the end of this Kali Yuga to protect religious principles.